What if we create our own version of the Dhalia Farms and Gardens in Denver? The Dahlia Campus for Health and Well-Being is the result of a strong partnership between the Mental Health Center of Denver and the Northeast Park Hill community, understanding that those in the community are the ones who know best how to improve their health and well-being. Denver’s Northeast Park Hill is a proud neighborhood filled with strong people. Built in the 1950s, Dahlia Square was the largest African-American-owned shopping center in the U.S. with a thriving grocery store, roller-skating rink, bowling alley and a full array of local businesses. But times changed and gradually the once popular neighborhood nucleus became an eyesore and was razed. It became a gaping hole in the neighborhood fabric. Over the years, many groups from outside the community offered help. But promises were broken, plans fell apart and the vacant lot remained. When the Mental Health Center of Denver purchased the land several years ago, neighbors were wary. Maya Wheeler, an advocate for the African-American community, was one of them. She worried that mostly white clinicians and social workers would come into the primarily African-American and Latino neighborhood to solve community problems with prescription drugs. Lydia Prado, Ph.D., vice president of child and family services at the Mental Health Center of Denver, spent nearly three years meeting with community members and other stakeholders and listening to what people in the surrounding neighborhood wanted and needed to help their community thrive. “Little by little we got to know each other and crafted a vision together about what would make a difference,” she says. A stand-alone mental health center was not a top priority for neighborhood families and children. 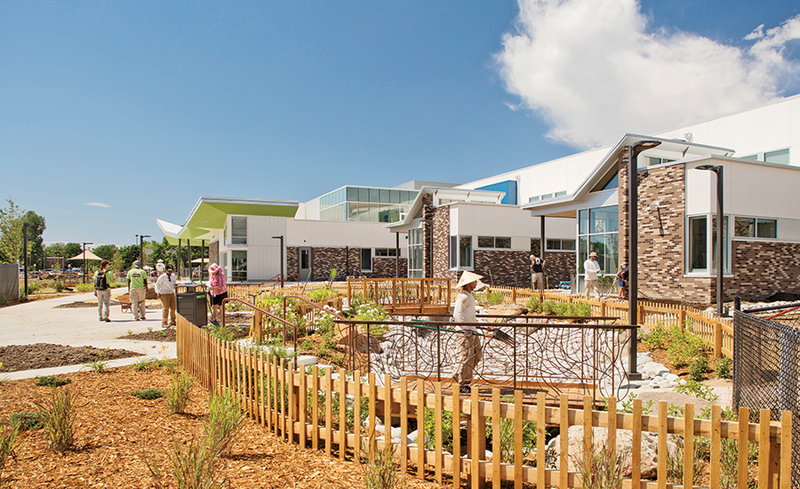 Higher on the list was a preschool, children’s dental care and a gathering place for social and educational activities with a focus on well-being. Topping the list of priorities was food—fresh, wholesome food. The neighborhood was in a “food desert” with no access to fresh food nearby and many relying on nearby gas stations to buy groceries. By listening to the community, Dr. Prado and her team responded by seeking out partnerships with an array of commercial and nonprofit service providers. Dahlia Campus now includes early childhood education, pediatric dentistry and classes ranging from Art to Zumba. Mental health components of well-being are integrated into Dahlia’s bustling intersection of services and amenities. Neighbors also helped give the new project a name: Dahlia Campus for Health & Well-Being. Especially unique for a mental health center, Dahlia Campus offers wholesome food. Food growing in the one-acre garden. Tilapia and catfish growing in nutrient-rich aquaponics tanks that nourish vegetables growing above. Food from local farmers and gardeners sold on site. Food distributed at a food pantry. Food prepared in a kitchen designed to teach nutritious cooking. Food growing around the neighborhood by newly minted urban gardeners. Since Dahlia Campus is not a traditional mental health clinic, people arrive for many different reasons—taking their kids to the dentist, enrolling a child in preschool, visiting the food pantry, attending a parenting class or learning how to grow a garden and prepare healthy meals. Social activities will feature gospel singing, recipe clubs, sewing and knitting circles, activities for grandparents raising grandchildren and much more. “We will provide opportunities focused on learning something new, feeling better, getting connected, having questions answered, all beyond traditional therapy groups, as well as the best treatment available,” says Dr. Prado.